I am going to be trying out lobsters this year as well. 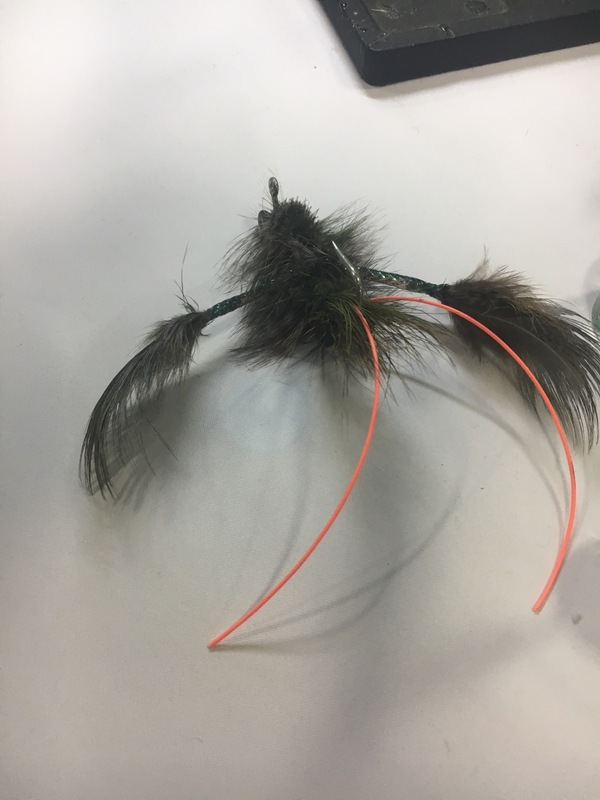 This one was a prototype so it doesn't have rattles or a really good hook but if it swims well I will tie one or two with good components and rattles in hopes of tangling with a beast of the night. Those will work great. 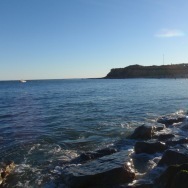 With the rattles in the fly I constantly use very small twitches with the rod tip to activate the rattle as it drifts along the sand bottom near base of jetty rocks. 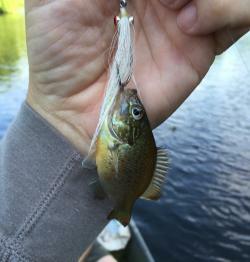 I also caught a nice fish using a sinking line on inside of an inlet at the edge of a flat. I basically cast lobster on the edge of flat drop off and let it sit on bottom. I would rattle then let it sit then rattle again. similar cadence to working a popper with very long pauses except the rattling/shaking is the pop/attraction. 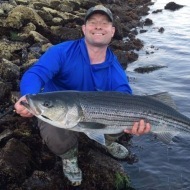 Got the idea from how the guys up in Maine fish crab flies on a sinking line ridiculously slow on bottom for big bass. Great, just the info I was looking for. 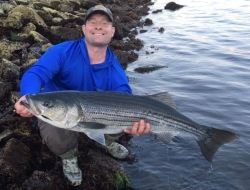 I used to fish freshwater bass religiously with conventional gear and a jig with rattles was one of my go to lures, it sounds like it will be fished similarly to the crab and lobster flies. 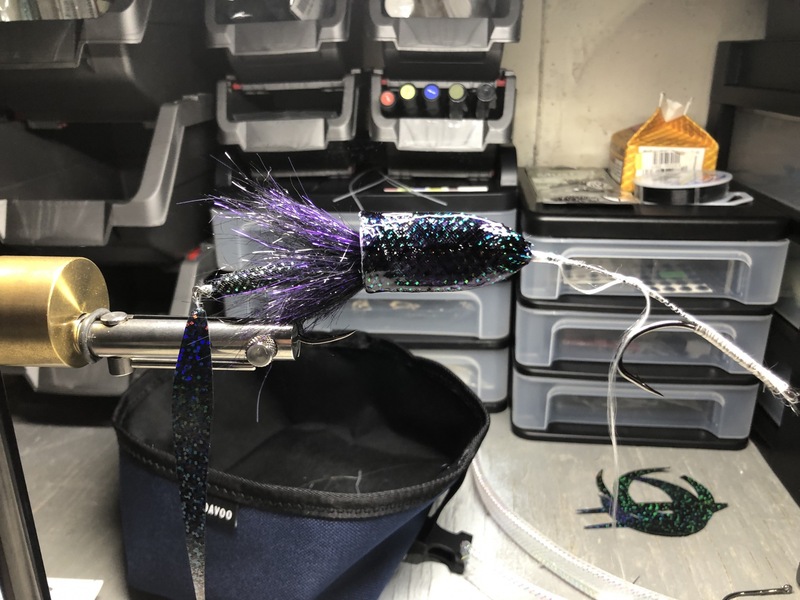 I will probably go for metallic rattles as I would think they will rattle louder than plastic, as well as add weight to help get the fly down. How big is too big for crabs and lobsters? The bigger one in that picture measures 10" with the antennae which are half the overall length. Or rather what size range should I aim for at night? The lobster fly I used was 7-8 inches so those are plently big enough. 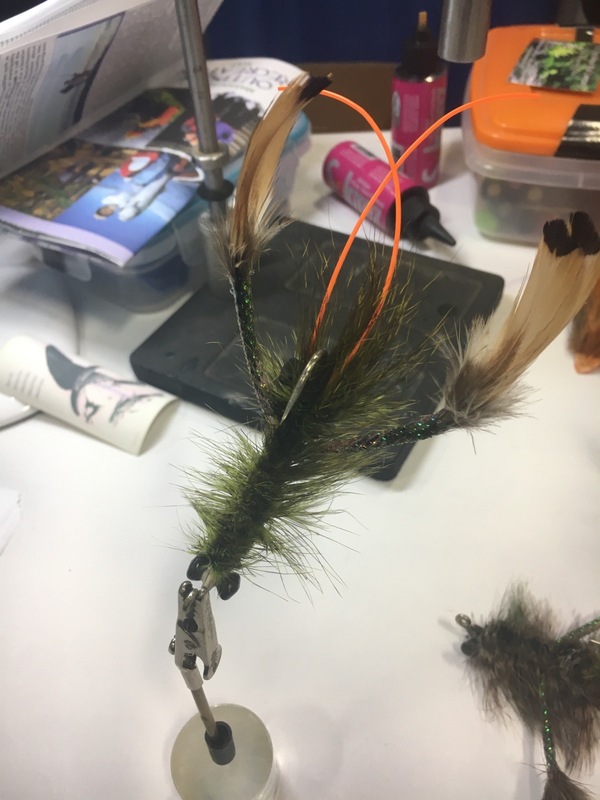 On crab flies I like a 3/0 or 4/0 jig hook and the shell portion to have a 3.5-4 inch width to represent a really large female green crab. However I did okay on smaller crab flies 1.5-2 inches wide too. 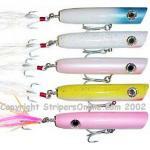 I am working on replacing these flies now so when done I will post pictures. I lost all my crab and lobster flies last season, which tells you they got a lot of use. Also just like freshwater name of game is being on bottom so expect to snag up occasionally. I hear you on that. Looking forward to those pictures. I tied my largest crabs on 5/0 hooks and they measure more like 2.5" so I wonder what I am doing differently. I may have to tie up some extra lobsters then but I still have to wait to see how they swim first. I'm quite looking forward to it because I like tying them a lot. Gives me an outlet for bucktails with nothing but hair on the backside left. I have been experimenting with weedguards as well, drawing from my experience with bass jigs. 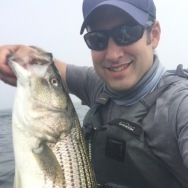 They use monofilament weedguards but heavy like minimum 11 strands around 25-30lb test. So I'm emulating that a bit and seeing how it works. 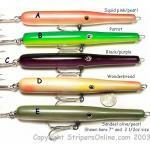 My hookups on bass jigs were never a problem so hopefully my flies with 4 strands 40lb doubled over will be fine too. If not I can always cut it off. Its probably materials you are using. Most people make their carbs with congo hair in posts off the hook or with a brush. 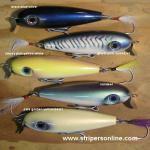 Mine are made using ez body tubing to create the shape and depth of crab body. 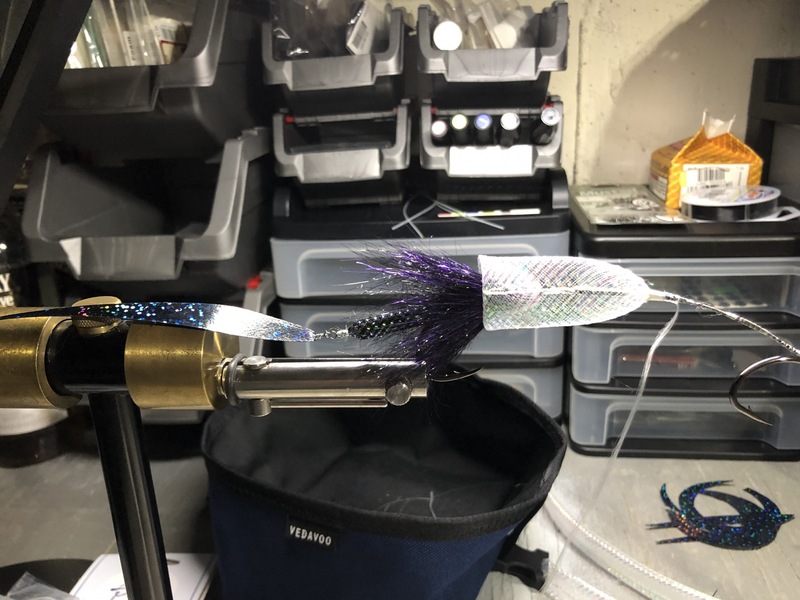 for the big crabs I use two ez body sections to create wider body then I cut the bottom and top shell out of kiley exo skin and glue on to mesh tubing. Everything is rubber or mesh tubing I have no natural materials in my crab flies. I should add I am also very interested in your lobster pattern. I only know of a few. 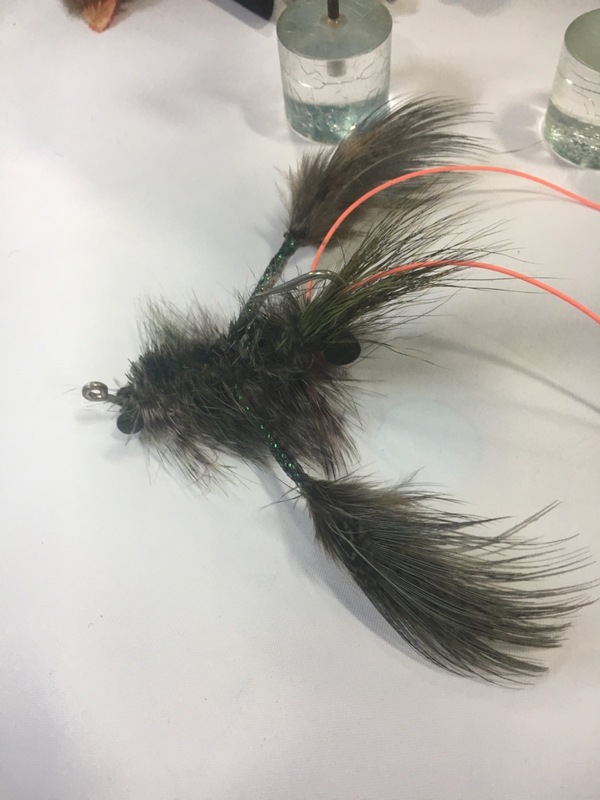 Namely, Dave skoks slobster, the lobster in a bag from Peluso's Saltwater Flies of the Northeast, and Kenny Abrames pattern: the bugster. 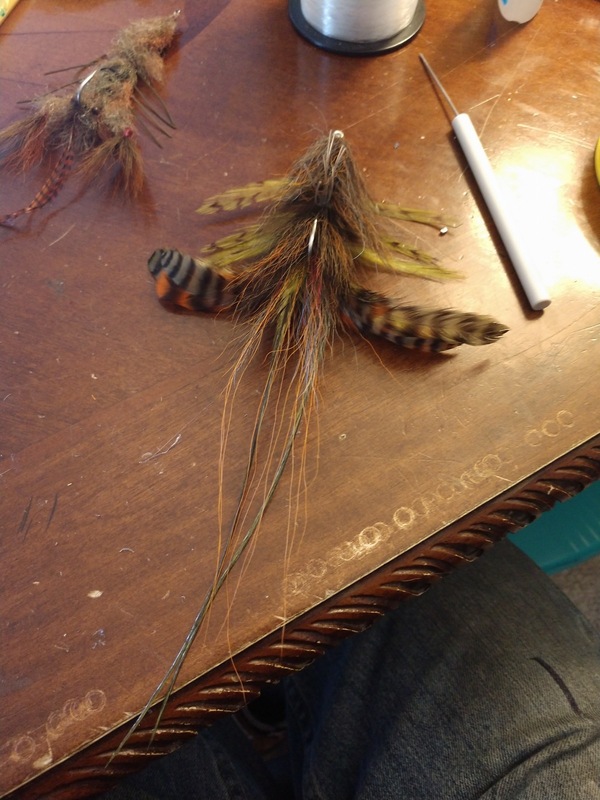 That last pattern I have only seen a picture of but it intrigues me as Kenny is huge on sparseness, translucency, and natural movement of materials in the current like a wet fly or soft hackle. But a lobster is not at all translucent except perhaps when it melts and isn't flowy and doesn't wriggle around like an eel or baitfish does. 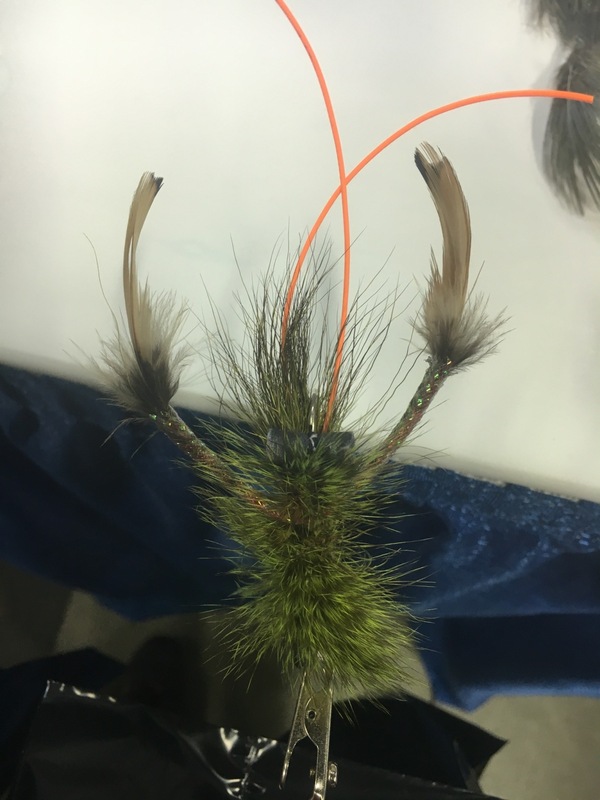 So it is interesting as it collides with a lot of his fly tying philosophy. hopefully will make some up next week been really busy with work and family. Once you see it you will understand. if you are used to working with ez body its a fairly easy tie. It required free tying of materials without a vice by hand. I personally think this is very easy to do as its just simple wrapping to tie off sections and then again to tie them together. I like ez body because I can color blend copic maker into the softex to make it any color I want. so I use olive marker to get ez body olive colored like the green crabs. I will need to take time to make pictures of each step otherwise it will confuse people as its a non traditional approach. I made a much larger prototype fly using similar idea of primarily ez body for body sections I have to still swim test this but I have high hopes. Its inspired by @VanStaalSteve double rigged sluggo which has become one of my main night lures for surfcasting over last two years. In this case I am blending black copic marker to change the ez body to a black color. I find the color fills the mono sections and the pearl flash still comes through making a very cool effect. The same effect occurs on my crab fly body. the first picture shows base pearl ez body tubing. Second picture shows it after spreading and blending softex on the marker colored tubing. I think this illustrates well how the olive color works on ezbody crabs. mine is a variation of Rich Murphy's Soft Short. The pattern is in his book which if you dont own is worth buying. 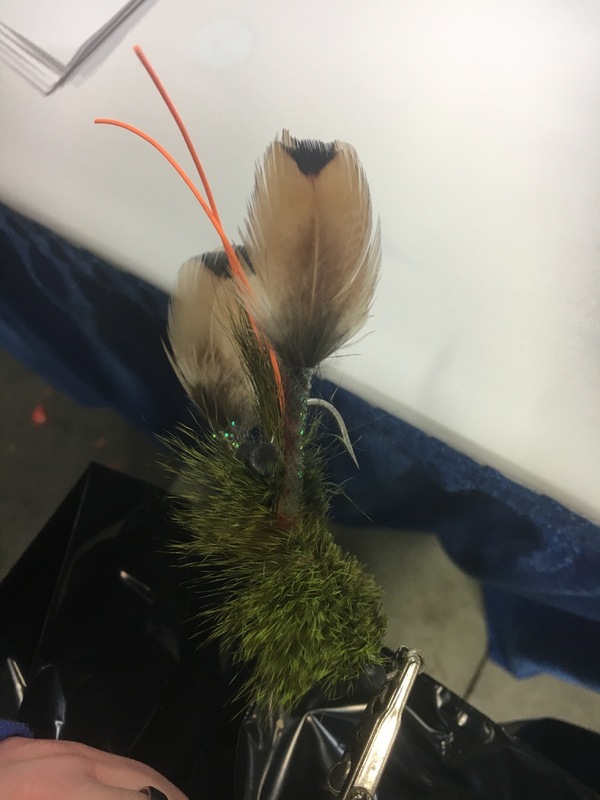 I attached pictures I took of Rich's actual fly at the 2018 fly fishing show. See it really opened my eyes as it has a huge profile the pic does not do it justice. I immediately decided I needed to make one and test it out in 2018 season. TGS, I am not disputing the effectiveness of rattles in flies. I have been using them on some of my patterns for the better part of 30 years now. I do question the notion that someone did sound testing on a real lobster, recorded it, and then developed a rattle that is the exact imitation. I was actually supposed to tie some of his rattle flies back in the day, but we could never agree on the proper compensation. He is out of that segment now I believe ? I actually have one of his rattles sitting right in front of me now on my kitchen table. 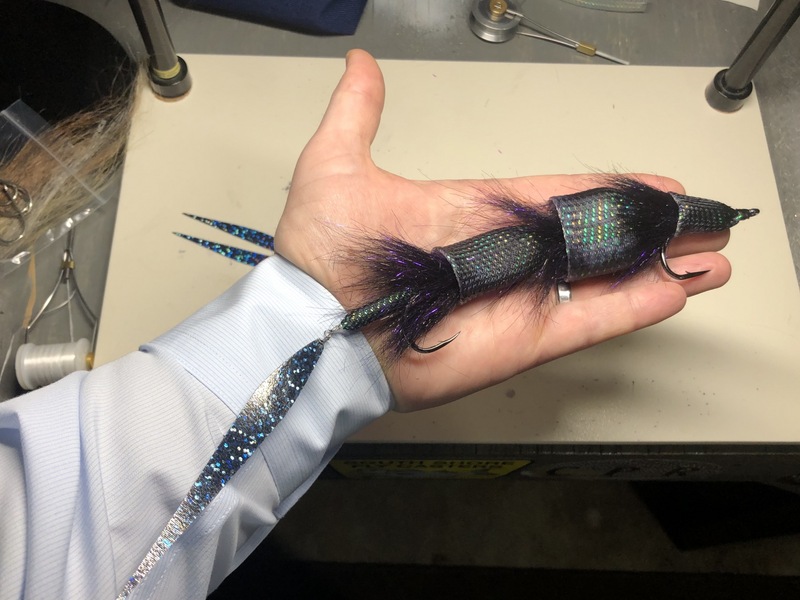 As far as lobster patterns go, the one tied by Dave Skok is pretty interesting..